This is the tour to take if you want to actively spend time in the wilderness, enjoy different natural habitats and watch birds and mammals. We go bog-shoeing in one of Europe’s largest raised bogs with breath-taking views of bog-pools and experience the peacefulness of old-growth forests. 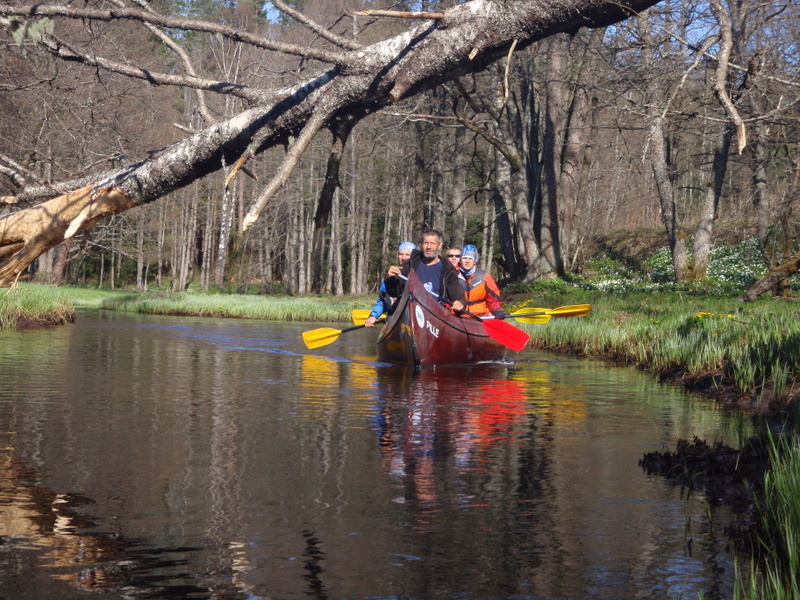 To explore the most stunning contrasts of Nordic nature, we go canoeing and hiking in Matsalu and Soomaa national parks and other protected areas. In addition to excellent sightseeing and activities in natural settings we tour (by bike) medieval Tallinn Old Town, an increasingly popular UNESCO World Heritage site. The Estonian coast is one of the main migration centerpoints in Europe. 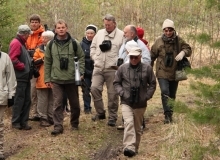 Up to 100 million migrating birds pass through in a year, drawing enthusiastic birders from all over Europe annually. 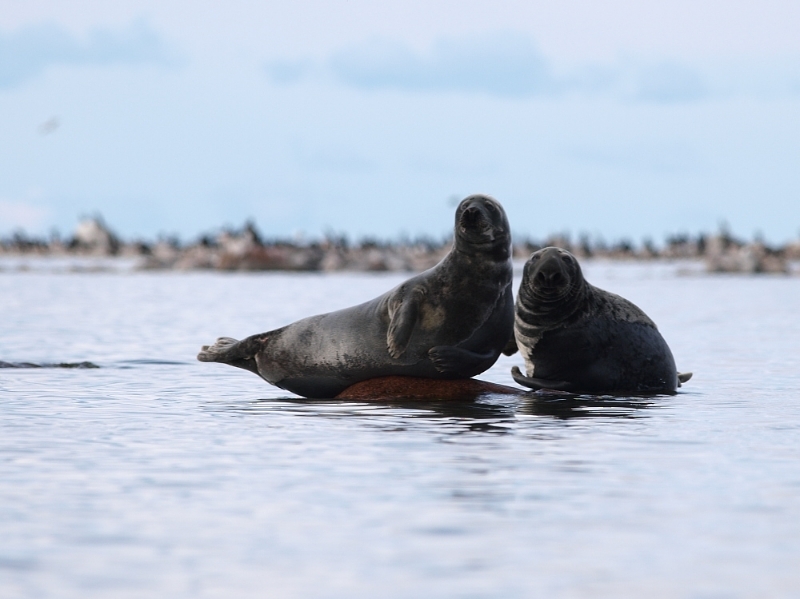 But around 700 Brown bears, 600 lynxes, 200 wolves, 12 000 Elks, thousands of Raccoon dogs, 16 000 Beavers, 1500 Ringed Seals and other mammals also live in Estonia. Western-taiga-type forests alternate with huge bogs and semi-natural habitats rich in plant species. An extensive network of protected areas has been created to preserve this diverse nature; 22% of Estonia’s land area is protected. Bog-shoeing in one of Europe’s largest raised bogs. Very good opportunity to see the Brown Bear in its natural habitat. Canoeing in Kasari River delta with beavers and bats flying over water. Walking on paths of bears, wolves and lynx. Hiking and exploring semi-natural habitats overflowing with plant species, wooded meadows and deep Nordic forests. Sights and sounds of thousands of cranes and geese, and millions of songbirds on their spring and autumn mass migration; a variety of woodpeckers, aristocratic Black Grouse and Capercaillie, Hazel Grouse, Eurasian Pygmy Owl, Ural Owl. Arrival in Tallinn. Then drive to Haapsalu. At sunset, we head off for a walk to listen to cranes, geese and watch their flight to their night stay. As we await dusk, we can also spot elks. Night in Haapsalu. Western Estonia is penetrated by the East Atlantic flyway which is used during migration by millions of Nordic birds to stop, rest and feed. A magnificent sight unfurls when tens of thousands of cranes, geese and millions of singing birds migrate. 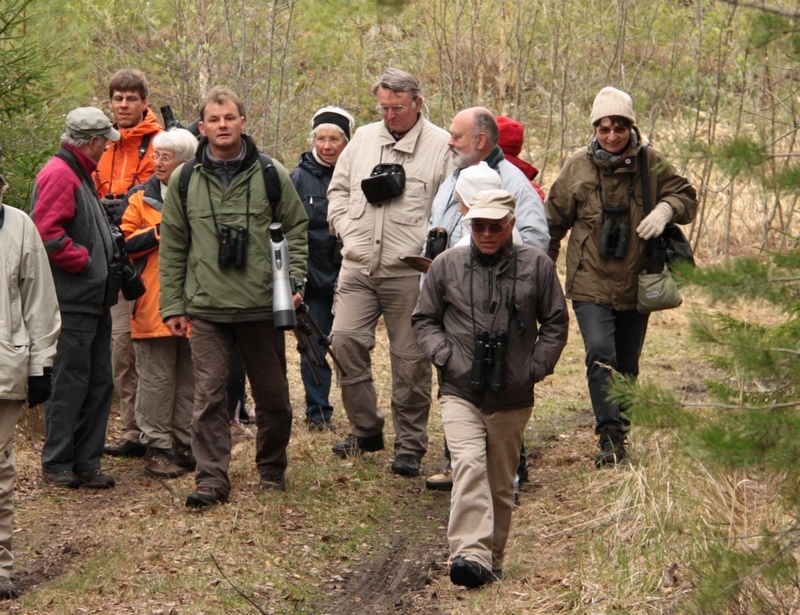 Thus, Matsalu National park is one of the most important bird migration centerpoints in Europe. Estonia’s coastal meadows, the largest reed beds on the Baltic Sea coast, shallow sea bays and islands offer migrating birds good feeding, resting and hiding opportunities. Many watchtowers near the migration route give observers opportunity to enjoy easily the sights and sounds as thousands of birds fly through the air. We will visit the well-known Matsalu birdwatching towers to witness the spectacular mass bird migration. 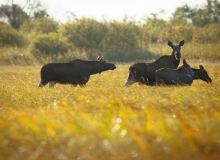 Just at sunrise, we walk to the Matsalu floodplain to watch the elks’ mating game and enjoy enchanting landscape views. In the evening we drive to the southern Matsalu bay for a 3-4 hour long canoe ride between reedbeds of the Kasari River delta. 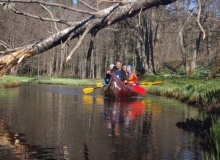 While paddling we hope to see beavers, birds and bats chasing insects. Night in Haapsalu. 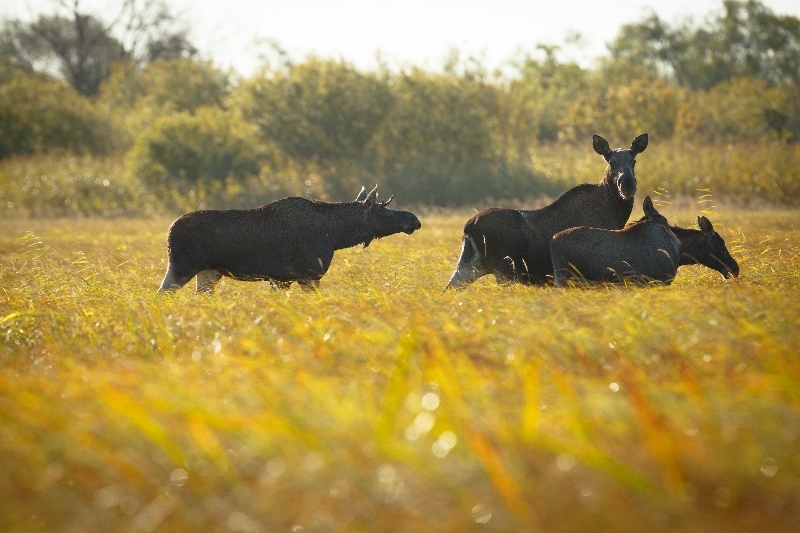 The broad and well-maintained coastal meadows and floodplains of the Matsalu National Park offer good habitats for elks; beaver families live in the delta of the Kasari River. In Autumn elks are in the middle of the busiest mating season. Great bull elks with elaborate horns seek to catch the attention of the elk cows, scraping the soil, rustling bushes; if that does not sort out the winner, intimidating battles follow. In Spring Elk cows cautiously bring their small calves to the meadows to eat. We drive to Soomaa National Park and take a half a day bog-shoeing hike to see unique bog landscape and experience the feeling of walking on wobbly land and take a stop at the watching tower for a picturesque view of the bog pools. We get acquainted with raised bog landscapes, unique plant habitats and the old-growth forest that towers between the bogs. Night in Soomaa. “Soomaa” literally means “land of bogs” in Estonian. Soomaa National Park consists of bogs with rivers winding amongst them. Raised bogs are like huge sponges what hold vast amounts of water. Bogs started to develop after the last ice age about 12 0000 years ago. Biggest of them cover 10 000 hectares and the peat layer is 8 metres thick. Bogs have a mosaic structure with bog-pools and bog islands what were in the past used as a hiding place during wars. Nowadays rare species like golden eagle and wolves find shelter on bog islands. 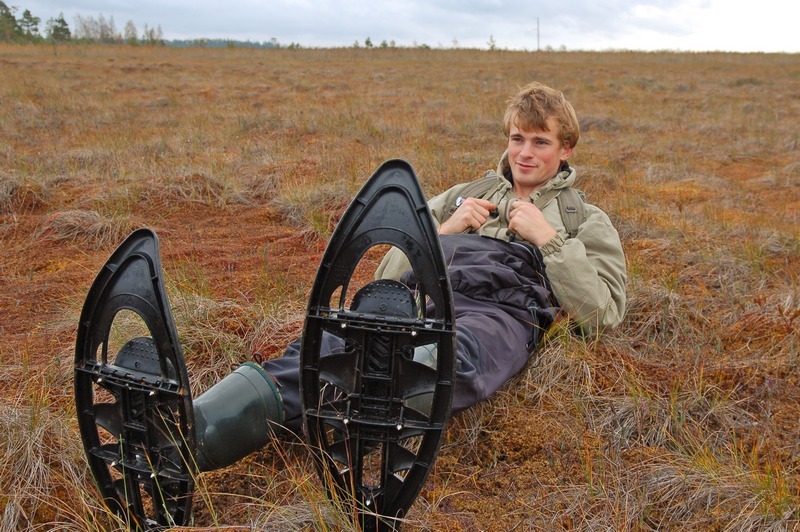 Since old times people have used bog-shoes, what look like snow-shoes, to make walking on spongy bog soil easier. Nowadays bog-shoeing is fun option to spend time in nature and hike. If you can manage a walk, you can manage a bog shoeing tour. Our morning starts before sunrise when we head out to view the Black Grouse lek. After that we are joined for the day by a research scientist who specializes in large carnivores, especially wolves. We explore Soomaa for marks of wolves and other mammals. Our guest scientist will talk about large carnivores – their biology, habitats and prey. Sometimes, remains of prey can be found. In case of good luck, on dark and silent nights, we may hear the howls of the wolves. Just before sunset, we’ll search for European smallest owl – Pygmy Owl – and after dark, the Ural Owl. Night in Soomaa. In the morning we drive to northeast Estonia’s Alutaguse wilderness area where we’ll tour the local forests before heading to the bear hide. 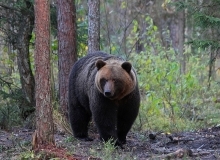 The hide offers an excellent possibility to see bears, racoon dogs, red fox and, from time to time, wild boars. The hide accommodates 10 people comfortably, with bunk beds, a dry toilet, viewing windows, chairs and sleeping bags. Night in the bear hide. Alutaguse, a huge forest and bog area, is situated in N-E Estonia near the Russian border. The forest area is typical Western taiga with aspen, birch, spruce and pine. 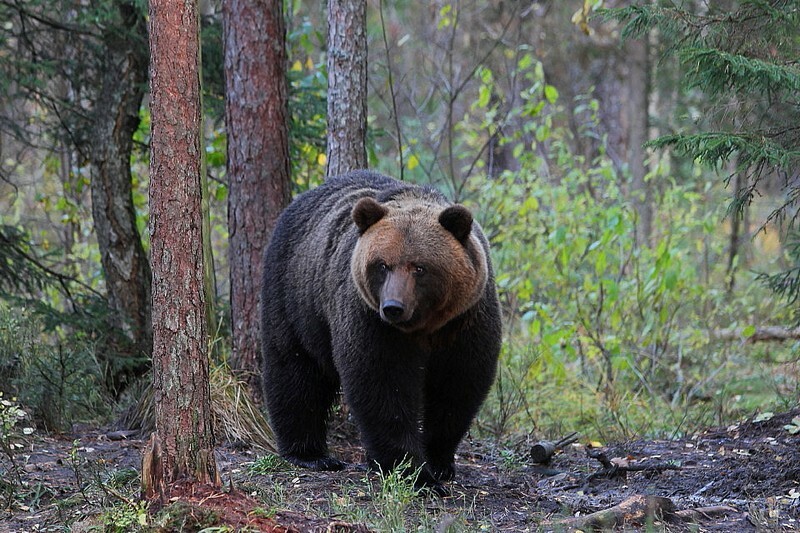 Alutaguse forests are home to about 300 bears — one of the best Brown Bear areas in Europe! Bear droppings, tracks and claw marks on the trees are easy to find. In Autumn bears are stuffing their stomachs to prepare for winter hibernation. In Spring hungry bears awake from their 5-month long diet and begin to roam. 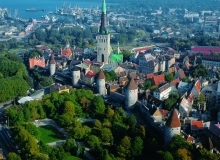 Guided bike tour in enchanting medieval Tallinn Old Town. Night in Tallinn. 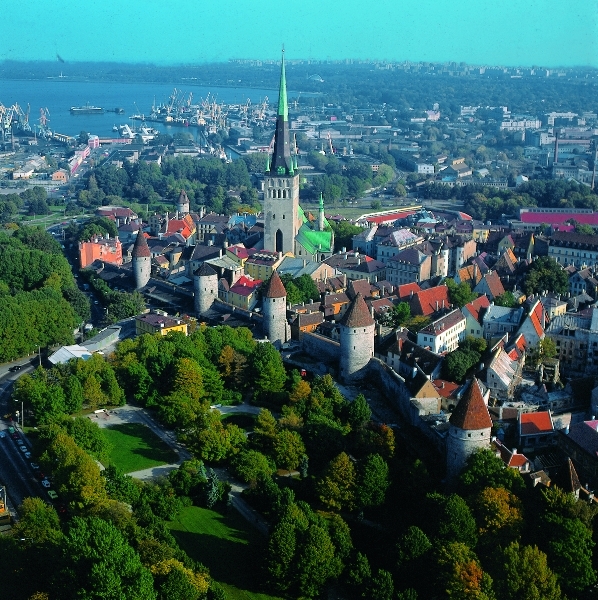 The well-preserved medieval town structure and surroundings of Tallinn Old Town, originating from the 11th to 15th Centuries, give it a place on the UNESCO World Heritage list. Streets and houses have been protected by a mostly intact city wall, complete with guard towers. Buildings, churches, merchant and craftsman houses maintain their centuries-old authenticity. Nowadays cosy cafes, boutiques and art galleries add vibrant life to the medieval atmosphere. from 9 people ask for an offer. 7 nights in hotels and guesthouses; toilet and shower in the room. 7 dinners and 7 lunch packages 7 breakfasts in the hotels.